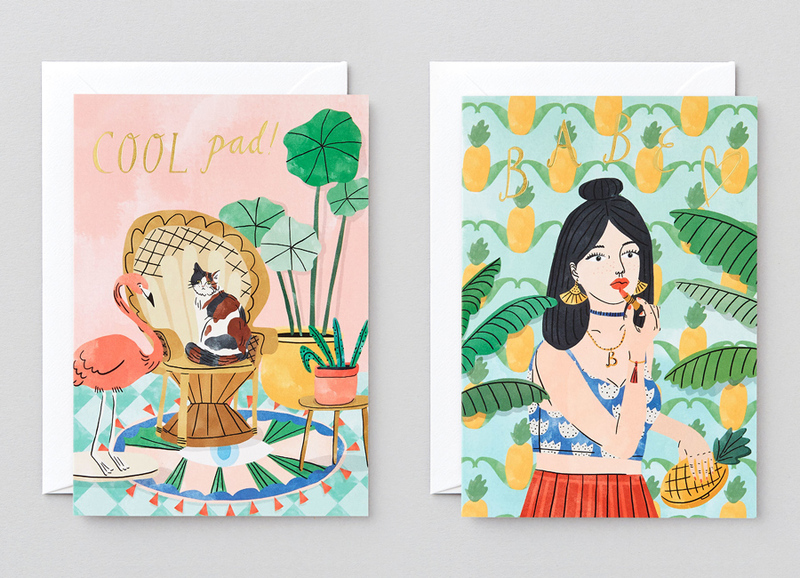 Wrap, a magazine and stationery shop for young creatives, enlisted the talents of Bodil Jane to produce a fresh collection of greetings cards. Seeking designs that reflect the cool, contemporary lifestyle of their customers, Bodil delivered eight quirky illustrations that exude a fun and youthful spirit. Thematically directed towards interior scenes and feminine subjects, this project was a perfect match for Bodil’s love of animals, plants and interiors. Her relaxed style provides each design with a sense of familiarity, creating homely settings and a chatty greeting for each occasion. Finished with gold foiling, Bodil’s hand lettering is brought to life, adding extra charm to these beautifully crafted cards. Get your hands on these gems by heading over to Bodil Jane’s Shop or the WRAP Shop.